The annual UACES* Prize recognising good British journalism about European affairs seems to be attracting an ever stronger list of nominees. This year’s shortlist included Tony Barber of the Financial Times for his series of articles on Saving the euro, Btonwen Maddox of Prospect Magazine for her piece on How the Greeks Broke Europe and Ian Traynor of the Guardian for a series on the Far Right and Immigration in Europe. But the prize was awarded to Gail Champion and Angus Stickler of BBC Radio 4 and the Bureau of Investigative Journalism for their File on 4 documentary on Europe’s Missing Millions. This was a fairly hard-hitting exposé of corruption within the EU structural funds system, notably involving the Mafia in Italy — which shows that UACES and the distinguished panel of judges don’t always favour Europhile stories. 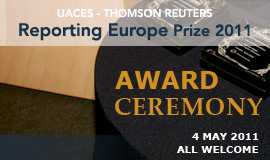 For the fourth year running, the awards ceremony was hosted by Thomson Reuters at their Canary Wharf headquarters and as ever it was a brilliant networking opportunity for those of us who spend a lot of time discussing EU issues, either as academics or as journalists or as both. At a ceremony at the Thomson Reuters headquarters in Canary Wharf last night David Rennie of the Economist was awarded the UACES-Thomson Reuters Reporting Prize for his Charlemagne column in the magazine. There was a particularly strong short-list this year, including BBC News’ Europe correspondent, Jonny Dymond, and my old BBC World Service colleague Oana Lungescu, but there was general agreement among the academics and journalists present that Rennie deserved the accolade. To look at, he is something of a young fogey: a sort of miniature Jacob Rees-Mogg, complete with braces, white handkerchief in his top pocket and severe glasses. But over the past five years that he has been in Brussels he has provided an insightful and often witty commetary on the goings on of the European Union and the wider Europe. He will be a hard act to follow.